Only remember what I have done. We will never forget and you are not forgotten! The “Spirit of Six” award was created by the South Dakota Peace Officers’ Association, and is named for the six Rapid City Cobbler cheerleaders killed March 17, 1968, in a plane crash on the way home from the boys state basketball tournament in Sioux Falls. (Left to Right) Junior Terry Blanton, Senior Shirley Landstrom, Senior Jan Glaze, Senior Kay McNutt, Junior Gail Flohr and Junior Diana McCluskey. Also killed in the crash were Ivan and Mary Landstrom, parents of Shirley, and Dorothy Lloyd, cheerleader advisor. Back then, we really did not have counselors to help, we just dealt with it on our own. It took the community and school district time to recover and the award helped. The Spirit of Six was first given on January 24, 1970 at the Ramkota Inn in Sioux Falls. Ten years later, on March 18, 1978 was the first time the South Dakota High School Athletic Association allowed the ceremony to be moved onto the floor in front of fans at the state basketball tournament. It has been a tournament highlight ever since. Thanks to the award, the memories we all cherish live on. Click HERE to watch the SDPB video. Click HERE or on the image to watch the video dedication. Most of the cheerleaders are buried at Mountain View Cemetery. Shirley Landstrom is buried at Pine Lawn Memorial Park. Jerry Mitchell arrived at Rapid City Municipal Airport on a warm, windy, St. Patrick’s Day Sunday morning, 50 years ago, just in time to witness a personal and very public tragedy. Mitchell, a private pilot himself, had been driving up Airport Road from S.D. Highway 44 east of Rapid City when a Beechcraft model E18s slammed to earth off the main runway and burst into flames. As he stepped out of his car, Mitchell knew his good friend and fellow pilot, Rapid City businessman Ivan Landstrom, had flown the Beechcraft, co-owned by Landstrom and Merle Ballew as B & L Aviation, to Sioux Falls along with several passengers. He also realized Landstrom and his charter passengers were to make their return flight to Rapid City that morning. “I thought, ‘Oh Christ, no, it can’t be him,’” said Mitchell as he watched flames engulf the wreck. “But it was.” Thirty feet, maybe 20, was all that separated Landstrom and his eight passengers from a safe landing that morning. As he had done countless times before, Landstrom lined up the twin-engined Beechcraft, nicknamed a Twin Beech, for what seemed to be a routine landing, in spite of steady crosswinds. Landstrom came in from the northwest, dipping the right wing to counter 20 mph winds sweeping across the runway. Witnesses would tell investigators the aircraft seemed to level off 20 to 30 feet above the runway. The right wing continued to rise with a slight nose-up attitude, likely from a particularly strong thrust of wind. Other witnesses reported an increase in engine noise, as if the pilot applied more throttle. The Twin Beech, witnesses said, then climbed in a steep left arc, barrel-rolled at an altitude of 50 to 100 feet, then cartwheeled into the ground to the left, or east of the runway. Mitchell said the wreckage was almost immediately engulfed in flames. Before the searing heat drove them back, would-be rescuers reported no movement, no sounds from inside the cabin. That moment, 11 a.m. on Sunday, March 17, 1968, is etched in the memories of Mitchell and those alive and aware then as one of the most profound tragedies ever to befall Rapid City, then a community of about 40,000 residents. A part of the city’s future, including some of the best and brightest of its children, perished that day. Joining Landstrom were his wife, Mary, and six Rapid City High School cheerleaders, including the Landstrom’s daughter Shirley and five schoolmates, Jannifer “Jan” Glaze, Laureen “Kay” McNutt, Gail Flohr, Diana McCluskey and Terry Blanton.The nine were returning from the state Class A basketball tournament in Sioux Falls, where the girls had cheered the Cobblers to the consolation championship, fifth place behind champion Brookings. Also among the dead was English teacher and cheerleader adviser Dorothy Lloyd, a chaperone for the trip. Is this true?' Word spread of the crash, first by local radio reports heard by those returning from Sioux Falls by car. Rumors flew, with conflicting stories reporting members of the Cobbler basketball team involved. High school senior Gary Larson learned of the unfolding tragedy during a stop at a familiar place for Interstate 90 travelers, Al’s Oasis, in Chamberlain. “It was just buzzing through that restaurant like crazy,” he said in a telephone interview from Arizona. Fellow students and families were crying and scared, he said, asking “Is this true?” As the agonizing wait for news continued through the day, it became clear that an unspeakable horror had befallen what was then the city’s lone high school, with the opening of a second city high school, Rapid City Stevens, still two years away. County coroner George Behrens confirmed the worst when he released the names of the dead late afternoon Sunday, plunging the city, region and state into mourning. Gary Overby, then a 15-year-old freshman at South Junior High, was good friends with Rudy and Mary Flohr and their three children, Bill, Gail and Sam, next-door neighbors on East Utah Street in Robbinsdale. Rudy and Mary would receive word of their daughter’s death while in Missouri, where Rudy was working as a defense contractor for Sylvania. Overby’s sister had gone next door to feed Gail’s cat and await her return. She said the Flohrs' phone began to ring, with callers worriedly asking if Gail had returned home. Terry Blanton’s older sister Sharon, then a 20-year-old student at the University of Wyoming, first heard of the crash from a woman who owned the house where she lived in Laramie. The woman told Sharon of reports of a plane crash in Rapid City involving some high school cheerleaders. She asked if Terry might have known some of them, not realizing that all had been lost. Sharon’s heart sank when she called home. “When my mom answered, she was crying. That’s when I knew,” she said. Images too horrible to forget Telephone calls forever altered countless lives that day. Five decades later, former Rapid City Journal staff member Ed Martley wishes he hadn’t answered his home phone that fateful morning. “In those years, I was police reporter, and because of that, Freddie Schick, an operator at State Radio (and later mayor of Rapid City), called to let me know there was a plane crash and I should get myself out to the airport,” recalled Martley, retired and living in Rapid City. Martley said answering Schick’s phone call was his first mistake. “The second was going to the airport,” he said. Martley arrived at the airport in 20 minutes. Not far from the terminal building, then located north of the present terminal, were the remains of a large airplane listed on its side and burned. Emergency responders were preparing to remove the dead. “I knew all the police, so they let me poke around at will. After I looked into the interior of the airplane, I wished they hadn’t,” Martley said. Martley took photographs, made some notes and headed back to the Journal office. From his developed film, he weeded out the most graphic images, selecting those only showing the burned aircraft. “I have been trying unsuccessfully for the last 50 years, to forget what I saw,” he said. In the hours following the accident, residents and city officials questioned whether a lack of firefighting equipment at the airport had contributed to the human toll. Two men at the airport told Martley they had gathered every fire extinguisher they could find in the back of a pickup and rushed to the crash site. The handheld extinguishers were no match for the intense fire. Firefighters from both Rapid City and Ellsworth Air Force Base immediately mobilized and traveled about 10 miles to the airport in less than 20 minutes. Smothering foam applied by the Ellsworth fire crew finally quelled the blaze. The debate would continue in the days and weeks to follow, as the city mourned and began to bury its dead. Most, however, agreed that even a truck equipped with firefighting foam and a trained crew on site most likely wouldn’t have saved the plane’s occupants. As the city reeled, school superintendent Paul C. Stevens announced the cancellation of classes on Monday at the high school, then located on Columbus Street, declaring a day of mourning for the lost cheerleaders, Lloyd and the Landstroms. School officials described the cheerleaders as “the cream of the crop.” “They were as nice as any girls you’ll find,” Brian Brademeyer, a member of the high school student council told the Journal. 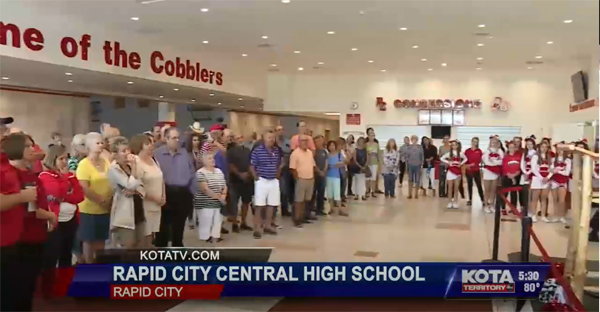 “They were involved in almost everything.” The following Thursday, grief-stricken residents and students filled the auditorium at Rapid City High School for a pair of identical memorial services, as letters of sympathy and memorials poured in. Among the remembrances, Pierre Riggs High School principal Gilbert Neiles expressed the school’s condolences and acknowledged the blossoming personal friendships between the Pierre and Rapid City cheerleaders. “No event in my memory has so shocked and saddened this school,” Neiles wrote. Students at North Junior High gathered $63.43 in loose change to contribute to a memorial to the cheerleaders. The reigning Miss South Dakota, Sally Jo Iverson, of Brandon, arranged the delivery of six red roses, one for each cheerleader, to be delivered to the high school. Funeral services continued for the next several days. Classmates served as pallbearers and also rallied in support of the families. Overby said students, some close friends of Gail’s and others not as close, filled the Flohrs' home all weeklong. "Kids just came and sat in the living room, keeping the Flohrs' company,” he said. Another family friend of the Landstroms offered to fly Sharon Blanton and a cousin to Rapid City. Approaching the Rapid City airport, they endured the sight of the charred crash site along with a blackened swath of grassland to the east also scorched by the wind-blown flames. Sharon said community support helped her and her grief-stricken parents, Bill and Dorothy, through Terry’s services at the First Presbyterian Church. “A florist friend told me there were no more flowers in Rapid City because of all the funerals and burials,” she said. It wasn’t easy for Sharon Blanton Tool to speak of her lost sister Terry. Even with tears flowing, she saw the conversation as a means of keeping a legacy of six Rapid City High School cheerleaders alive, 50 years after their tragic deaths. The pain of the March 17, 1968, air crash which took their lives certainly lingers for friends and family. But talking about the dark days and the cherished good times offers catharsis, they say, of grieving those lost so young: Jan Glaze, Shirley Landstrom, Laureen "Kay" McNutt, Terry Blanton, Diana McCluskey and Gail Flohr, along with Ivan Landstrom, his wife, Mary, and high school teacher and adviser Dorothy Lloyd. “Just imagine what they might have accomplished if they’d lived. They accomplished a lot for everyone who has been a part of keeping the spirit alive,” said Sharon, 70, of Sacramento, Calif. “It’s helped transcend the loss." Sharon described her sister Terry as an honest and down-to-earth girl who took ballet and had a lovely singing voice. Growing up in Rapid City, Sharon and Terry dressed in fancy western wear and rode horses in a parade for Range Days, the forerunner of the Central States Fair. Terry wasn't afraid of any challenge and could keep her friends from taking the wrong path, Sharon said. After Terry’s death, her father, Bill, would cut a small Christmas tree to place at her grave during the holidays. Sharon helped him decorate the tiny tree with ornaments. Sharon said community support in the immediate aftermath and through the years has helped families deal with the crushing loss of a child and sibling. “It’s been amazing and a source of solace that each individual family loss wasn’t in a vacuum. It was a loss to the community,” she said. It was a loss that may have been presaged by at least one of the victims. Another surviving parent, Vyonne Glaze, also wondered if her oldest daughter Jan’s star would burn too brightly to last. In a 2015 interview with the Journal for a story on dealing with sudden death, Vyonne said Jan was an exceptional student. She had also been voted homecoming queen the previous fall. “Everything she tried for, she won,” Vyonne said. “It sometimes seemed all too perfect. I remember thinking, ‘Maybe she is going to die young.”’ All of the girls were leaders in their respective classes. The “cream of the crop,” a school official said. Glaze, Landstrom and McNutt were seniors. Flohr, McCluskey and Blanton were juniors. “They were the ones everybody looked up to,” said senior classmate Jim Lintz, a Hermosa rancher, former state legislator and current Custer County commissioner. A star athlete on Cobbler basketball and football teams, Lintz joined other classmates in a wrenching duty, serving as pallbearer for many of the funerals. Many people still don’t know how hard the deaths were on students and families, he said. “It made a lot of us grow up a lot faster than we wanted to,” Lintz said. He remembers Shirley Landstrom as a gifted athlete who had little chance, aside from an annual powder-puff football game for girls, to show off her athleticism. “I’ve always thought it’s too bad they didn’t have girls basketball at the time," Lintz said. "She would have really excelled. She was quite a competitor." Lintz and Landstrom dated off-and-on for several years going back to eighth grade at Rapid City South Junior High School. They had planned to get back together following the state basketball tournament, he said. Don McNutt said his younger sister, Laureen "Kay" McNutt, tenaciously pursued becoming a cheerleader her senior year. Making the varsity squad when you hadn’t been chosen as a junior was unusual, he said. “She did (make it). She wanted that badly and called us when she achieved it,” he said. McNutt, of West Des Moines, Iowa, was 8 years old when Kay was born. Growing up in a home in the West Boulevard area of Rapid City, he said his younger sister could be a pain at times, but they grew closer as the age gap shrank. “I was pleased that she always got so excited when I came home for the holidays,” he said. Classmate Mary Beth (Howe) Johnson called McNutt one of her closest friends in more ways than one. They also wore the same size clothes. They would trade clothes back and forth, Johnson recalled. After Kay’s death, Johnson went to her house to return the borrowed clothing and retrieve hers. “So hard,” she said. Dottie Crawford Olson was head cheerleader her senior year in 1967. Jan Glaze and Shirley Landstrom had made the squad as juniors. Adviser Dorothy Lloyd was a strict disciplinarian in the English and Literature classes she taught. She also set rigid standards for her cheerleaders, Olson said. “She was such a kind person, she laid out the standards she wanted us to develop in our cheering technique, everything from the cheers to the way we dressed, not chewing gum and not wearing dangly earrings,” Olson said. If the student cheering section began to boo or jeer the other team, the cheerleaders were tasked to stop it. “It was our job to inspire the kids and lead them in cheers,” Olson said. “She (Lloyd) ensured that we did that. That was the standard she wanted us to achieve.” That standard was the impetus for the Spirit of Six award, a trophy sponsored by the South Dakota Peace Officers Association since 1969 and given to a squad of cheerleaders at all state basketball tournaments. The award is based on cheerleader decorum, appearance and sportsmanship, qualities the six Cobbler cheerleaders exemplified through Lloyd’s guidance. Lloyd was widowed three years before the crash that took her life. She is buried at Black Hills National Cemetery with her husband, Clarence. Ivan and Mary Landstrom were pillars in the community. Ivan founded Landstrom’s Jewelry in 1943, soon after moving to Rapid City from Minneapolis where his family settled from Sweden. He also owned several other businesses, among them Landstrom’s Black Hills Gold Jewelry and Black Hills Glass & Mirror. He also co-owned B & L Aviation and had logged more than 10,000 hours as a pilot, often donating flight time to help others in times of medical or family emergencies. His wife, Mary, was secretary of the Rapid City Girls Club. Surviving family members feared Ivan Landstrom would be blamed for the tragedy. “Everybody realized it was an accident,” Lintz said. “We never blamed anybody.” More attention at the time was placed on the lack of substantial firefighting capability at the airport. The crash eventually led to the building of a fire department substation at what is now Rapid City Regional Airport. Other surviving classmates have also picked up the mantle of keeping the legacy alive. Gary Overby, a friend and neighbor of the Flohr family now living in Tracy Calif., was instrumental in efforts to fund and create a replica memorial to the cheerleaders in front of Rapid City High School on Columbus Street. An original memorial had been moved from the old high school building to the new Central High School in 1980. After the recent remodeling of Central, the memorial containing the names of the cheerleaders is in a part of the building no longer readily accessible to the public. The replica memorial was erected last fall and on Friday, a wreath remembering the cheerleaders was placed there in spite of a heavy snowstorm. Classmate Gary Larson said the Rapid City High School class of 1968 was comprised of more than 700 graduates, the second to last class of RCHS before the change to Central High School and the opening of the new Stevens High School for the 1969-70 school year. The adversity those final classes endured brought them closer together, Larson said. “We’re a big class, but a cohesive one, and we’ve grown more cohesive,” he said. Johnson said plans for the 50-year reunion of the Class of ’68 in September include visits to the cheerleaders’ graves and a visit from Vyonne Glaze, who celebrated her 90th birthday on March 4. Sharon Blanton Tool said the spirit exemplified by the six cheerleaders remains present and relevant today.